Applications: Use in all applications you might have traditionally used emery cloth. 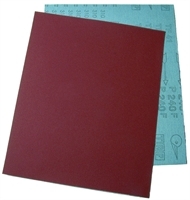 With a high purity aluminium oxide, these sheets are ideal for heavy duty sanding applications on metal and wood. Product Notes: In standard 230x280mm sheets. Can be cut length or width ways to suit half or third sheet sander. Heavy duty 'F' weight backing. Also Available: We offer this material in roll form if you prefer using strips.